You spot a cute boy (we’ll call him Boy A). You dream about Boy A. You do whatever it takes to make Boy A notice you. Even though Boy A doesn’t pursue you, you hang on to your dream of Boy A until he (a) moves to the North Pole with no access to a cell phone or computer, (b) dies and is buried or cremated, or (c) begins dating another girl. You mend your broken heart by hating Boy A and finding another cute boy (Boy B). You replace Boy A with Boy B and begin all over again . . .
I’ve gone through an entire alphabet—and more—of boys over the years. As I share my journal entries and stories—the good, the bad, and the ugly—you’ll be encouraged to trust God with your love life and buckle up for the ride! 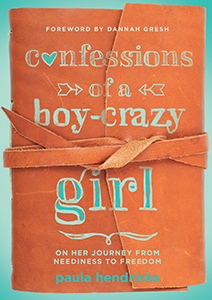 Written for teen girls, Confessions of a Boy-Crazy Girl will help you on your own journey from neediness to freedom. Really spend time with her and look into her eyes. See the snow white of her skin and the cascade in her brunette hair. Read the entire foreword . . .
Teenage girls often look to others for security and significance—most often, it’s boys. Good-looking boys. That was me at the age of sixteen, and had someone put this book in my hands back then, who knows the heartaches I could’ve avoided. 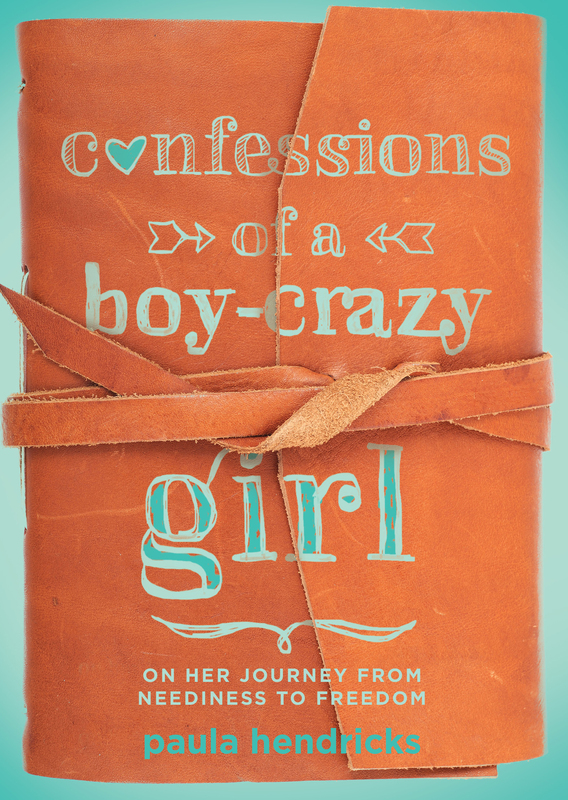 Confessions of a Boy-Crazy Girl is a must-read for today’s young women! What a joy it has been to watch Paula on her “journey from neediness to freedom.” The transformation has been nothing short of remarkable. Her reflections on that journey are honest, engaging, refreshing, and insightful. In this book, young women will find Paula to be a relatable, caring, wise friend. She will make you laugh; she will make you cry; she will make you think. And she will point you to the only true Satisfaction for a heart that longs to be chosen and cherished. Love the boy. Hate the boy. Long for the boy. Wait for the boy. If you want off the roller coaster ride of romance, this book is your ticket. In a style that feels like a great conversation with a good friend, Paula gives us front row seats to her up and down ride on the roller coaster of love and then teaches us that there is a better way. You will be encouraged, inspired, and entertained by her story and ultimately you’ll find the surprising secret to the lasting Love you’re looking for. There are not many words that describe this book . . . because it was amazing. I cannot tell you how much it related to me and gave me the example and Scripture I needed to get through my obstacles. I am really boy crazy and love the thought of love, but this book helped me in more ways than could be counted. With encouraging transparency, deep faith, and wisdom learned in the crucible of pain, Paula Hendricks invites us into her heart. As I read, I saw myself over and over again: as a “boy-crazy girl” and as a woman who has been taught by Christ that He “is in the business of transforming broken girls into beautiful trophies of his grace.” Nothing is more soul-satisfying than the realization that surrender of all to him is not a loss at all. If you are a boy-crazy girl (or woman) or if you’re a mom or grandmother who knows one, this book is a wonderful resource. I heartily recommend it! Here is warm, wise, and clear-headed counsel from someone who has dug past the surface and has identified the root cause of boy-craziness. Paula knows firsthand about the “expulsive power of a new affection.” Take the quiz in the first chapter and see if this book is for you or for someone you know. Paula allows us to take a peek into her life through stories, transparent journal entries, and God’s guidance along the way. She’s relatable, humorous, practical and just plain real. Gospel-saturated and biblically sound, Confessions of a Boy-Crazy Girl provides wisdom for young girls, teens, and moms navigating the tendencies of our boy crazy hearts. Paula has written a book that gives hope for every boy-crazy girl. Paula Hendricks has charged right into the heads and hearts of most females with her Confessions. I wish I could’ve read this book as a young teen; it addresses so many common temptations and provides gospel-centered help. With refreshing transparency, Paula invites the reader into her struggles with image, beauty, insecurity, lust, and of course—guys! Paula comes alongside the reader as a friend and opens her heart to tell her story. She doesn’t run from the tough questions, but uses Scripture to grapple with the heart issues. If you’re a teen, you need this book. If you’re a parent or you have input into young women’s lives, you need this book. May the life lessons Paula shares here impact the next generation for God’s glory! Boy-crazy? It doesn’t have to define you! There’s a way to get your heart back. Jump inside Confessions, get to know Paula, and find your way out. And in the process, you’ll discover that the true love you seek is actually seeking you. A great read that is both poignant and relevant to teens today. Paula speaks truth into the lives of her readers in a way that convicts, motivates, and inspires. I know it inspired me! Confessions of a Boy-Crazy Girl is so brutally honest and biblically encouraging that I wish I had read it when I was younger. Like Paula, I also believed that all I had to do was trust God enough and be pretty enough to attract a boy. Wrong! If you’re the least bit boy-crazy like Paula (and like me) you will be thoroughly encouraged challenged in your faith and relationships. In Confessions of a Boy-Crazy Girl, Paula bravely opens her heart and journals to confess what many young women struggle with—a deep need for a guy’s approval. This raw and honest look into her journey will encourage others to seek the One worthy of seeking. Paula shares how God helped her step off the crazy cycle of heartbreak over meaningless crushes and get on to a more meaningful relationship with Him. I’ve watched dozens of “boy-crazy girls” wrestle with God on their journey of trying to find love, value, and acceptance in romantic relationships. In Confessions of a Boy-Crazy Girl, Paula intentionally reorients all girls to the gospel with gut-level openness and honesty, and for that I am grateful.